Every summer in England crop circles make the news for a few days. But journalists never really attempt to "solve" the question of who is responsible. Are crop circles man-made? How? 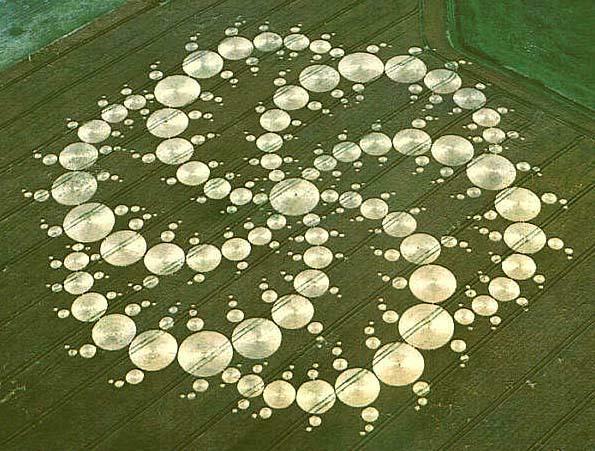 There are several prominent instances of humans creating crop circles. The article reporting on the circles also notes that after the Bower and Chorley made their announcement in 1991, a large number of crop circles began appearing in England, giving evidence for a host of copycats. Statistically, this is strong evidence that humans must be responsible for at least some of the formations. very simple crop-crushing tools of a wooden plank, rope and a baseball cap “fitted with a loop of wire to help them walk in a straight line”. One such team is known as the Circlemakers, and when – in a rare breach of secrecy – it allowed BBC filmmakers to document its construction of a 100-circle roulette pattern in 1998, team members were observed physically implanting circles at the remarkable rate of one every minute. Circlemaker Will Russell summarized their motivation: “To push the boundaries of what people think is humanly possible”, while his colleague Rod Dickinson stressed that this rate was sufficient to imprint the Triple Julia pattern in one night. Traditional circle-makers employed “stompers” (wooden planks attached to two hand-held ropes), string and garden rollers, plus bar stools to allow artists to vault over undisturbed crops. Despite their primitive appearance, stompers are a surprisingly efficient tool for flattening crops, especially when driven by skilled hands. However, modern designs have evolved beyond the traditional requirement that stalks be flattened rather than broken: formations now feature stalks that are carefully sculpted to create intricate textures within the geometries. For example, the stalks in each of the circles of the Triple Julia pattern formed a spiral. Multiple layers of bent stalks can also be woven together, creating shadowy textures that evolve over days in the sunlight due to the stalks’ phototropic responses. Some members of the group have published a book on making crop circles, and Circlemakers' official website has a basic guide on construction. The competitors had to arrive at the tent by 9pm, when they were given the final rules and instructions. They were free to work in their plots in the hours of darkness, between 10pm and 3am, when they had to leave the field. During this period, members of the organising group were patrolling the area to make sure there was no sabotage of other people’s plots by contestants or by anyone else, and after all the teams had left the field, the area was guarded by Sir Francis Dashwood’s gamekeepers. The experiment was conclusive. Humans could indeed make all the features of state-of-the-art crop formations at that time. Eleven of the twelve teams made more or less impressive formations that followed the set design. The contest was reported in most of the British newspapers and on radio and TV. Some people jumped to the conclusion that all crop circles must be hoaxes. The sceptics were pleased with the outcome, although they had been so sceptical about the competition itself and had refused to cooperate in its organization. Ridley’s team was the only one that did not attempt to follow the set design, pducing a question mark instead. After the competition I took part in many interviews, in which I pointed out that although the results showed that it was possible to hoax crop circles, it did not prove that all were hoaxes. The fact that it is possible to forge a £50 note does not prove that all £50 notes are forgeries. So humans can absolutely create crop circles, and have done so many times in the past. But there have been records of crop circles appearing long before Bower and Chorley (who, while obviously not the first crop-circle-makers, started the recent trend). 1674/1678 - A woodcut depicts a farmer's story of a "mowing devil" who cut his field. It's not really in line with future instances, though. 1686 - Robert Plot, in a lengthy historic tome, discusses findings of such circles. 1880 - John Rand Capron writes a letter to Nature about seeing crop circles. 1932 - E. C. Curwen photographs one and publishes it in Sussex Notes and Queries. Although the investigator talked about the possibility of the marks being left by a wheel, it is clear in the report that the marks were more likely left by a 135-ton aircraft or spacecraft. These are obviously not the only pre-Bower-and-Chorley circles, but they are examples that could not be explained by human activity. It is true that in most cases thorough investigations were not carried out (with the possible exception of the Duhamel report), so humans could still be the culprits. Thanks to coleopterist, I saw this National Geographic article on ancient "crop circles". It discusses old structures in (ironically) southern England that are thought to be 6,000 years old. The structures are barrows - mass tombs where certain members of a tribe were buried. The odd thing? Only parts of people were buried in barrows. This one has not yet been excavated, but its contents may be the same as that of other barrows. Another interesting article on crop circles can be found here. There have been clear proofs that humans can easily make crop circles, and many of the early ones in England were indeed the work of humans. Evidence (i.e. the explosion in the number of circles after Bower and Chorley admitted they had made the circles) exists to show that most of the later ones seem to be human-made, and many people have in fact admitted to making crop circles. There have been earlier reports involving potentially supernatural events, but investigations into them were either nonexistent or too lax to provide any conclusive information (again, with the exception of the instance in Duhamel). So yes, some crop circles are man-made, especially recent ones in the U.K., as you alluded to - and can be made with a variety of simple methods, as described above - but we can never know who made some of them. 1 Warning: Large-ish file that could take some time to load. 2 Meaden eventually admitted that the designs could not all be attributed to natural causes. As is well known, buried archaeological features are capable of affecting growth of crops above them, especially cereals. Plants growing over a ditch, for instance, in dried conditions will have longer stems and a greater leaf area than those in the rest of the field. If there is a storm, long-stemmed plants with a lot of leaves will catch the wind and be blown over first, thereby producing patterns of archaeological (and geological) significance. The article goes on to say that this is highly unlikely to produce crop circles, though it could produce smaller formations. Not the answer you're looking for? Browse other questions tagged united-kingdom agriculture ufo crop-circles . Are media reports about squatters' rights accurate? Is 2016 cursed for celebrities? Is this a photo of a rough sleeper who froze to death? Were modern wheat varieties specifically selected because it was less nutritious?